Welcome to PerkStop Perk-It Daily deals and discounts. Enjoy local daily deals and extended deals from local merchants and vendors in the Central Oregon region. Simply print off your coupon from your computer or show it to the merchant business instantly from your smartphone, tablet pad (Apple ipad, Hp touchpad, Blackberry Playbook, etc), or pad computer. Share...Share...Share....If you find a deal coupon and know someone who would benefit from it...Perk-It & share! Plan your next snowmobile adventure! Gift certificate is valid for 2 years from date of purchase. Cannot be combined with any other offer. Must mention this ad. Enjoy a water sport adventure today! This coupon is valid for use on all ski boat 12 hour rental periods. Cannot be combined with any other offer. Must mention this ad. White House | Black Market Up to 50% off Sale! Ponte! Prints! Pleats! And of course, plenty of Little Black Dresses...Shop our must-love styles while you can. Up to 50% OFF! 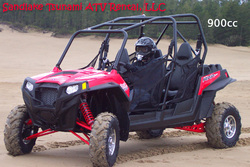 Click picture for OHV Side-by-Side UTV Rental website. This coupon is good for $30 off a full day or $15 off a 1/2 day OHV Side-by-Side UTV Rental. Thinking about buying a UTV this year? These are brand new models so Rent a UTV today before you buy. Come experience Central Oregon from a new perspective. 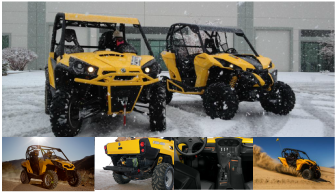 We supply you with a 2012-13 fuel-injected four stroke BRP CanAm Commander 1000 or BRP Canam Maverick 1000 for your off-road Central Oregon adventure. Heading out of town? No Problem. We have hourly, daily, and multiday rates available. BRP CanAm Commander 1000 or BRP Canam Maverick 1000* Aluminum Trailer * Helmet * Anti-fog Goggles * Required Safety Equipment * Use of Annual Park Pass if needed* Detailed Trail Map. Enjoy a water sport adventure today! Our fuel injected 3 person Yamaha Skis are a blast to drive and have plenty of power for tubing too! This coupon is valid for use on all jet ski rental models for our 12 hour rental periods. Gift certificate is valid for 2 years from date of purchase. Cannot be combined with any other offer. Must mention this ad. Looking for something fun to do while vacationing in Bend, Oregon? Are you going camping and want to add a little RC racing action to your weekend getaway? 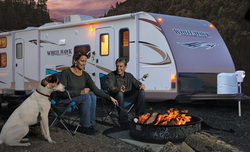 Check out the NEW models offered at Central Oregon Rentals in Bend, Oregon. They provide everything you need to get out there and play. Is the Central Oregon Coast in your future? If it is, here is your chance get a great deal on a Revolutionary machine....the Polaris Razor XP 4. Yep I said 4! 4 seats to strap the whole family in safely as you cruise the coastline of the Sandlake Dunes. You are sure to get the most out of your dune adventure with an powerful 900cc fuel injected engine, all-wheel drive, and sport-tuned suspension at your command. Climbing hills, traversing bowls, and navigating the whoops are a blast while riding in style with your friends and family. 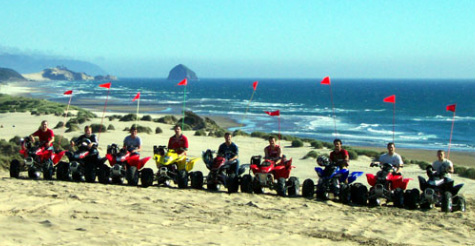 Join us at the Sandlake Dunes on the Central Oregon coastline. 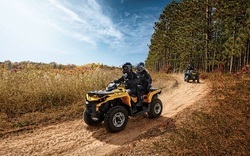 Save 20% on any two hour ATV rental - That's 20% savings on any 90cc, 250cc, 400cc, or 450cc quad!